Brighton Festival is due to take place from 4 to 26 May and there are set to be so many exciting literary events on offer. The festival this year is bringing forward issues of representation, with numerous speakers set to be discussing their careers and experiences of representation within literature and journalism. There will also be other artistic events, including dance, music and film. This collaborative multi-arts festival is heavily anticipated by Brighton locals and is an exciting way to embrace your love of the arts. With the festival just round the corner, we got the chance to catch up with Charlie Brinkhurst-Cuff, who will be speaking at Some Small Isle, alongside Zena Edwards, Sharmaine Lovegrove & Roger Robinson. Charlie will be speaking about her anthology, Mother Country, which responds to the events of the Windrush scandal. Alongside this, Charlie also works on the editorial of gal-dem magazine, which aims to give women of colour a start into their journalism careers. We spoke to Charlie about her career and her upcoming event at Brighton Festival, which is definitely not one to miss this May. You are set to appear at Brighton Festival’s event Some Small Isle, alongside Zena Edwards, Sharmaine Lovegrove & Roger Robinson, how did this collaboration come about? To be honest it was brought on by the people who are curating the festival. They had read my book, Mother Country, and they asked if I would like to be involved with one of their events. So yeah it was as simple as that! At the event, you will be talking about Mother Country, the anthology you edited. For anyone who doesn’t already know, can you tell us a bit about the anthology? It was born out of the Windrush scandal, but that is not its primary focus. It tells the story of the Windrush generation and those following that, which meant I interviewed 30 people in total, of which about 22 stories appear in the book. They range from ‘celebrity’ voices to ‘ordinary’ people. That was because I was really keen not to see the same story just repeated over and over again. 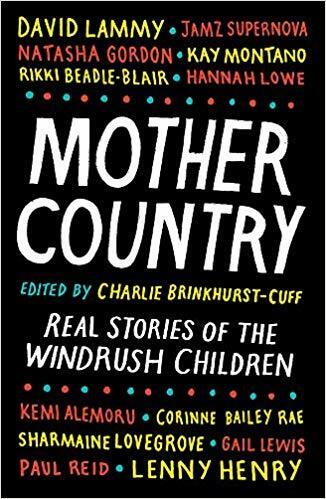 In particular Mother Country focuses upon the voices of women, because (as the book lays out), the women’s Windrush narrative has not been very well represented in the mainstream academic canon and the media. But it also looks back and disrupts the narrative that has been happening around the Windrush generation in other ways. It tries to challenge the ‘good immigrant’ stereotype and the way that people decided to talk about the Windrush generation, in the public and in the press. The image of these people was that they were asked to come over here and they worked super hard, and they were British citizens and that is how they viewed themselves and still do. Whilst all of that is true, what it misses is the people who don’t fit so neatly within those margins, people who didn’t come over during the government defined period, from 1948-1973, or people who came from other colonial entities, not just the Caribbean. The book touches upon all of those things and how, even though these were essentially ‘good immigrants’, if you want to call them that, I think these margins should extend beyond that with the way that British colonialism played out. We need to understand them as human beings and their experiences of the ‘good life’ when they get here as well. You worked with so many people who contributed to the anthology. What was it like coordinating such a collaborative process? It was very rigorous and structured and I reached out to loads of different people, some of them said no and some of them said yes. I travelled all around the country and took a good few hours with each person to truly get to know their story. I wanted to represent them in an authentic way so each feature that I did, apart from any parts that were edited, I would write up in the first person, so it was in their voice. Then it was just a process of going backwards and forwards to figure out what works for them, in terms of how I was representing them and how they wanted to be represented. It was both easy and hard, but they gave me their time and they understood the importance of a text like this and allowed me to speak to them about quite personal things in a very personal manner. Ultimately, I think I had it quite easy. Although most of the process was easy, did you encounter any problems when making the anthology? Just the deadlines and timings. I only had two months to turn it around, which is quite quick as you would normally have up to a year. The scale of writing a book in two months is very hard [laughs], but apart from that there were no major problems. The experiences in the anthology span over 70 years, from before the Windrush generation and beyond it. How do you think the issues and experiences discussed relate to young people, who may be experiencing racism in the UK today? I guess it proves that it has been present for a long time and it is useful for everyone to know their history, but in terms of actually dealing with racism, these experiences have never been fully discussed in the UK. So in terms of the Windrush generation, people tended to, in my experience, speak and think about racism in a different way to how we think about it today. A lot of things were repressed as when you are making such big choices, it probably isn’t that helpful to be wallowing in it. Also, these people came to a new country and have chosen to do it, at least in part, to help their family, and to tell them about how difficult it’s been for you and how you’ve suffered, in terms of racism, is hard. But for second and third generation migrants, you’d talk to your grandparents and they would be like ‘no nothing like that ever happened’ and then you talk to them about it some more and you find out differently. One of the women in the book, got off the boat and she had bottles thrown at her and people chasing her down the street So many people went through experiences like that from the minute they arrived. But also, for our generation, there are still people affected by it.There was one person in the book whose father was caught up in the Windrush scandal and, as far as I am aware, to this day he still doesn’t have a passport he can use. So, he can’t leave the country due to the way that the government are treating people. Yeah, that’s how I’d say it’s affecting people today. What has been the reception of the anthology since its recent publication? Was it as you expected? It has been very positive, I have had some nice reviews and been able to attend some great events. On the whole it’s been good. Of course, as well as your work on the book, you are also the Head of Editorial of gal-dem magazine. What was the incentive to get involved with this publication? I have been at gal-dem since the very beginning and my role has changed as I have gone along. I got involved with gal-dem because I was aware, before my career even started and when I was at university, that there was a problem in the media with representation in their content, and I was waiting for something new like gal-dem to come along. That changed in July 2015. I turned up and I didn’t know any of the girls, we hadn’t launched yet and I was so excited that I was able to get involved with this project. We didn’t really know what we were doing, we were very naive, but somehow we have now managed to turn it into a solidified business. I have worked at gal-dem since before my career in the media began and the spaces I have worked in a professional capacity, and on work experience placements, have been aware of what I am doing on-the-side with gal-dem. We were rightfully picked up from early in our existence as a place to watch and a place to come to for certain types of content. Within our first year we were nominated for an award up against the Financial Times, which is pretty unprecedented for an independent publication. It has been a good few years and there is still a lot of work to be done in terms of finding the problems with representation in content within the media. Where do you see gal-dem going from this point onwards? What are your plans for the publication in the future? That is what we are figuring out now. We have been so focused on getting to where we are now – we have developed and grown so much and we don’t want to go away anytime soon. We want to be a space that represents non binary people of colour and women of colour and we want to be a place where they can come and get their first steps into journalism. We want to stay true to our ethical commitments, but beyond that you will have to wait and see [laughs]. Gal-dem aims to diversify the field of journalism and bring more recognition for work by women of colour. As an industry, what do you think are some of the issues surrounding representation in the media? I think the media is still around 94% white and 55% male, so obviously one step is hiring more people of colour and hiring more women in senior positions. But, they need to do that consciously, rather than hoping that people will just come to them. Beyond that, there are different reasons why people from different backgrounds may feel that the media isn’t for them. Quite individualistically, this can range from class reasons to cultural reasons and in some ways this happens before hiring processes even come along. I think with gal-dem what we have proven is that there is certainly the appetite out there for it and there is certainly enough people out there. At the moment, those wider issues are not gal-dem’s concern as we have created our own platform, but the wider media should also support us and other smaller publications. There are already more and more independent publications emerging, but whether or not they are able to sustain themselves is another question entirely. It is really hard to moving from a volunteer platform to one where you can pay staff, writers and everyone else who is involved with making a media platform successful. gal-dem are going to do everything they can to support independent publications that are run by people of colour, and any other organisations really. I can’t imagine that these new publications are going away any time soon, as if we feel like we are not being represented by the media then we will go out and do our own thing. What were some of the difficult things about going out on your own and taking that independent step? I think it is about finding the right team of people. It is not even about what is hard – it is about what a team needs to be to succeed. For us, it was about finding those right people to work together. Having Liv, who has taught herself everything she needs to know about business, made it work. Then having Mariel Richards in a full-time role in strategy and brand partnerships has been invaluable to our development. We have all also been informally mentored by so many people in the industry that has got us to where we are, I am very grateful for that. From this point onwards then, what are your aims for your future career? I am not particularly career focused in the traditional sense of the word, I have just worked hard and gone for whatever. I don’t know what will happen [laughs]. I love working with gal-dem and I hope to be doing that indefinitely. For any young women of colour looking to enter into a career in editing, publishing or journalism. What advice would you want to pass onto them? I think the key thing for me is not being afraid of the written word, and being yourself, even when everything is not always easy. Learning to be brave would be a piece of advice I would want to pass on.